Electric shavers are a grooming investment, with dry versions saving you money on shaving cream and wet shavers saving you the cost of razors. They offer users years, instead of weeks, worth of use, but because they are an investment, buying the right razor is imperative. 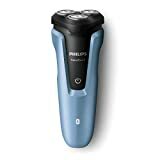 To help you make the best choice, easily, we have put together this informative electric shavers buying guide. Rotary Electric Shavers: Rotary shavers have circular blades that follow the contours of the body to enable users to shave in any direction. Perfectly suited for people with thick, coarse hair, they work quietly and efficiently and can handle the trickier areas like chins and upper lips. Because they also work on longer length hair, people who don’t want to shave every day will find this shaver ideal for them. Foil Electric Shavers: Foil shavers have steel foils that sit behind the blades and move them from side to side. Offering up to four blades, they provide a quicker and closer shave. They can be found at more price points and some include springs to ensure the right pressure is directed at all times. Well suited for shorter hair, foil shavers are a good fit for people wanting to shave daily. Foil razors come in three types and choosing between them will depend on hair type: Single foil for medium hair, double foil for coarse hair and sensitive skin, and triple foil that can tackle long or short hair. 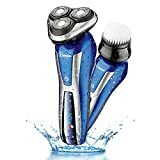 Wet/Dry Electric Shavers: Electric shavers are either able to shave wet, dry, or both. Wet shavers provide a more comfortable shave as users can use use shaving creams or gels. Dry shavers offer a much quicker shave without any of the fuss. Combination wet and dry shavers offer users the best of both worlds, and offer owners a lot more flexibility. 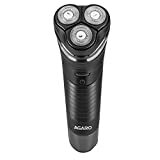 Shave: Reviewers rate their electric shavers on their shaving ability, and shavers that provide a close shave are rated much higher. To ensure you get shaving satisfaction, choose a shaver based on your hair type and the frequency with which you want to shave. Operation Noise: When it comes to high ratings, electric shavers that offer little or no operation noise are king. If this is a concern for you, choose a rotary over a foil blade and check online reviews of the top brands to ensure you are buying a shaver that is quiet enough for you. Grip: Shavers that have a comfortable handle offering good grip are reviewed much higher by their owners than ones that don’t. Versatility: The more versatile a shaver is, the higher the ratings. That means combination wet/dry shavers are much more popular than wet or dry only. Added features, like built in trimmers, are also reviewed well for adding function to the shaver. 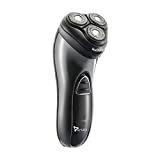 A good quality electric shaver should include a two year warranty. Make sure you check which parts, if not all of them, are included in the shaver warranty to ensure you are covered in the unlikely event that something needs replacing. Some features to consider to add more functionality to you your new electric shaver are: a pivoting head that makes shaving over difficult areas, like the chin, much easier; a pop up trimmer that can turn your shaver into a beard trimmer, giving you the functions of two machines; built-in moisturizing for sensitive skin; and a comfortable grip that is slip proof. Electric shavers can either be corded or cordless. Corded shavers offer a lot more movement flexibility, while corded models do not need to be charged and can be plugged in and used. Cordless shavers batteries can be either regular (offering great value for money) or rechargeable (saving the hassle of regular replacing), and are sized well for travel. When choosing cordless, opt for a shaver that only takes up to 90 minutes to fully charge, saving a lot of unnecessary waiting. If it offers a quick-charge feature then even better! This feature will enable you to quickly charge if the battery runs out in the middle of a shave. A few higher end cordless electric shavers will include a USB port for easy charging. This is a super handy feature while traveling and will ensure you can charge your shaver anywhere, anytime. If you prefer a quieter shave, buying a rotary shaver is your best bet. They are also much more suited for longer hair, which means more time between shaves. Foil electric shavers get the closest shaves and because they mimic the movements you would make with a disposable razor, they make for great first-time electrical shavers and will suit beginners better. 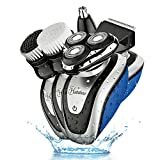 Choose an electrical shaver that allows you to shave wet and dry, especially if you have sensitive skin, as this will always allow you to shave with cream and/or gel. For those that like to shave in the shower, choose a fully waterproof model. Braun: Braun, a German company, is known for its pioneering engineering and innovation in home electrical appliances. Their shavers and home grooming products are renowned for their reliability and longevity. 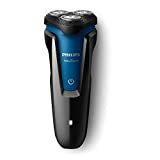 Philips: Founded in 1895 and soon becoming a leading name in light bulbs, Philips have grown over the years to become masters of home electrical appliances, and channel years of experience and technology development into all their products, including quality grooming. Panasonic: A household home electronics name, Panasonic America was established in 1959 with the aim to make products that impact people's lives positively. Extending into all electrical areas, including electric shavers, they are a well known brand supplying quality products.